The Honda Grand Prix of Brazil started today in Indaiatuba with the Qualifying races of MX1 and MX2. Monster Energy Yamaha's David Philippaerts won his first Lovemytime Pole Position Award in Indaiatuba, while Ken Roczen obtained his fourth one. David Philippaerts won his first MX1 qualifying race of the season and he will be the first one to choose the starting grid tomorrow morning. Second was Steven Frossard and third Antonio Cairoli. Clement Desalle crashed several times and could only be 12th. In the MX2, Ken Roczen dominated once again the qualifying race from beginning to end and he obtained his fourth Lovemytime pole position award. His team-mate Jeffrey Herlings finished in second position and third was Gautier Paulin. Tommy Searle was disqualified for accepting outside assistance. Monster Energy Yamaha's David Philippaerts did an excellent start and managed to pass his team-mate Steven Frossard at lap five. Philippaerts also won the qualifying race in Campo Grande last year and he actually admitted that he felt really confortable at the track. Second was his team-mate Steven Frossard, who after taking the holeshot he could not keep the lead and stayed second the rest of the race. The French was focused on his riding and he is determined to go for the overall win tomorrow and improve his fourth position in the championship. Red Bull Teka KTM Factory Racing MX1's Antonio Cairoli crashed at the opening lap and he had to push up from the eighth position. The Italian was a bit disappointed for the mistake he did, but he is confident for tomorrow as he had a very good speed and he feels very well physically. Kawasaki Racing Team's Xavier Boog did a very good qualifying race starting from the third position, but Italian Cairoli overtook him with just two laps to go. However, Boog succeeded to be at front again, so he is very confident for tomorrow's races. Steve Ramon from Rockstar Energy World MX1 completed the top five after starting from an initial eleventh position. Ramon still has some pain on his neck after his crash in Glen Helen, but it has been proved that it won't be an obstacle to ride at the front at tomorrow's races. Current leader of the MX1 class Clement Desalle started at the front in the qualifying race, but crashed several times and could only finish 12th. Max Nagl did not feel very confortable in the Brazilian track and could only finish ninth in the pre-qualifying practice and eleventh in the qualifying race. Evgeny Bobryshev, third overall in Glen Helen, managed to ride third at the beginning of the race, but he made many mistakes and he finally entered the finish line in the 17th position. Carlos Campano was fourth in the opening lap and rode at the front until he crashed and dropped several positions. Campano finished 15th, followed by home rider Antonio Jorge Balbi. Red Bull Teka KTM Factory Racing MX2's Ken Roczen dominated the whole MX2 qualifying race and finished almost 19 seconds ahead of second classified Jeffrey Herlings. At some point of the race he could see his team-mate Jeffrey Herlings and Tommy Searle closing the gap, but he was riding so confident that he succeeded in keeping the lead. Jeffrey Herlings did a very good start but Tommy Searle had a better speed and the Dutch rode third most of the race. Herlings was riding right after Searle, when the Brit made a mistake and Herlings took the second position until the checkered flag. Monster Energy Yamaha's Gautier Pauline did one of the best races of the season and after a good start he finished third. Tomorrow he will have the chance to choose a good gate for the start and he might be able to obtain his first podium of the season. Zach Osborne from Bike-it Cosworth Wild Wolf Yamaha started eighth, but he managed to overtake some riders and finish fourth. After the bittersweet weekend in Glen Helen, a podium would be a great boost for the American rider to regain some confidence. Completing the top five was Arnaud Tonus. The Swiss rider missed the podium last year in Brazil being tight in points with Jeremy Van Horebeek, so this fifth position in the qualifying race might help him to be on the rostrum this weekend in Indaiatuba. 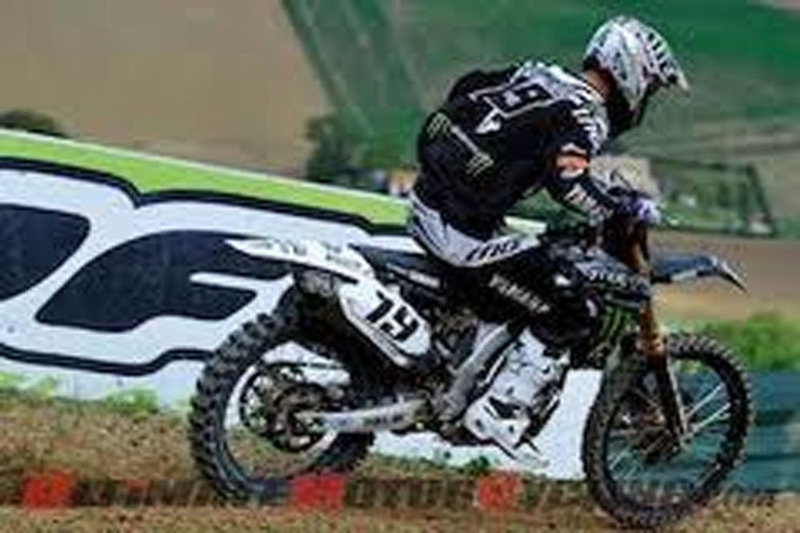 Tommy Searle was defending his second position from the likes of Herlings, when he made a mistake and crashed. While trying to start the bike, Searle received outside assistance and was disqualified from the race. The British rider will be the last one to choose the gate for tomorrow's races, so he might have some problems to ride among the leaders of the race.